MatrixPE > Blog > Bed Bugs > Bed Bugs Infesting Your San Francisco Bay Area Hotel? Bed Bugs in your SF Bay Area Hotel Rooms? Deal with It Now, Before a Catastrophic Yelp Review Torpedoes Your Bay Area Hotel! The San Francisco pest control team at MatrixPE empathizes with the plight of Bay Area hotel owners. Even if you have systems to keep your facility spotless and comfortable; horrible, yucky pests, bugs, mice and other creatures can turn your well-kept paradise into a nightmare zone and earn your hotel decidedly non-sympathetic reviews on Yelp and other social rating websites. 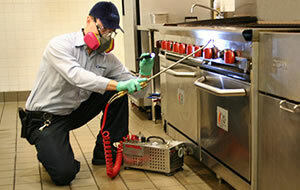 Bay Area bed bug control requires more than just common sense. According to the National Pest Management Association (NPMA), since 2001, bed bug infestations have spiked by 71%. Theories abound about why this is happening. Changes in methods of pest control as well as increased travel may be partly to blame. Bed bugs are very hard to eliminate permanently, because they’re so difficult to see. A well-trained, vigilant staff can put up a yeoman’s defense. But no housekeeping staff is invincible. So if you’ve gotten even one complaint from an unsatisfied guest, call the MatrixPE team immediately to audit your facility and rid you of those bed bugs.. The American Hotel Lodging Association says that “The vast majority of hotels” has been minimally impacted by bed bugs, but you don’t want your hotel facility to be that rare case. Although bed bugs are not as pestilential as, say, rats; they can irritate your guests and bring in bad press. Plus, stories about bed bugs in hotel rooms have a funny way of spreading like wildfire. Just like you would probably tell all your friends if you found a cockroach in your soup; so, too, would you probably tell all your friends if bed bugs bit you at a hotel — particularly a “luxury” hotel. In addition to helping you dispatch your current bed bug issue, our team can help you install effective processes and systems to protect your facility against future pest problems. Call Matrix PE today! Our friendly representatives will call you back and setup a free, no obligation discussion about your hotel (or other facility) bed bug situation. MatrixPE serves all of California, including Sacramento and Hollywood.